California is a wonderful state to go camping in, especially in the summer. There are all kinds of different ecosystems to choose from, plenty of fun adventures to go on, and the beautiful sun-bathed days and golden sunsets. It’s no wonder the call it the golden state! There are tons of amazing places to go camping in the beautiful state of California. Below I have compiled a list of my favorite places to camp near San Francisco that will leave you completely blown away and have you leaving with life-long memories. Del Valle Regional Park is a beautiful camping area in Del Valle, CA. It has a 5-mile long lake in the middle of it and is surrounded by beautiful oak-covered hills. It is surrounded by miles of beautiful scenery and tons of activities to keep you busy for weeks! This campground is great for a summer get-away trip. Del Valle has any and all activities you can think of to do on your outdoor adventure vacation. They have horseback riding, boat rentals, boat tours, beaches with lifeguards, windsurfing and sailboarding, hiking, fishing, and more. It is also a super accessible and comfort-providing campground with restrooms, showers, parking, a ranger stations, a visitor’s center, and even handicap access. It is a place that is seeking to provide luxury for any type of adventure seeker! Del Valle Regional Park is only an hour and 45 minutes outside San Francisco, providing a great escape from the city rush, but close enough to make day trips over during your vacation for some great tourist activities if you desire. Kirk Creek is a beautiful ocean-side campground that sets you up on bluffs overlooking the Pacific Ocean. 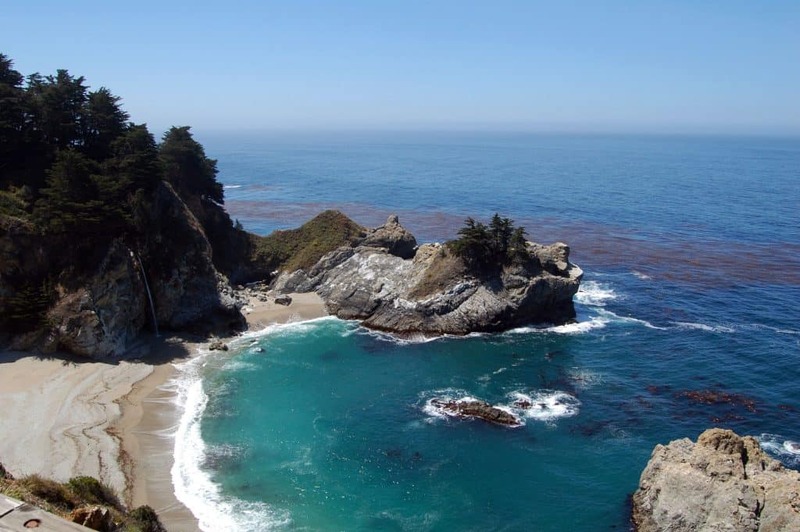 It is located on the Big Sur coastline and has lots of beautiful views and adventurous activities to offer. This gorgeous campground offers plenty of activities such as hiking, fishing, swimming, mountain biking, horseback riding, sunbathing in the California sun, surfing, mountain biking, and lots more exploring opportunities. This campground and surrounding area are also very dog-friendly so you can bring your four-legged friend with you wherever you go on your adventures under the sun. There are all kinds of gorgeous views and scenery you can drive, hike, or even horseback ride to near this campsite. You can find waterfalls, redwood groves, mountain meadows, streams, beaches and coves, and many more California wonders to be found. This campground is not completely luxury oriented, in which they have pit toilets and no electricity, but they have accessible grills, accessible scenic overlooks, and even accessible campsites for those who need them. This campsite is a solid 4 hour and a 20-minute drive from San Francisco, so you would need to make San Francisco a day trip if you decided to stay here in Big Sur, but it is almost worth at least stopping by here for a while because of the gorgeous views and experiences. Kirby Cove is another amazing place to camp near San Francisco. This is a super small campsite just 20 minutes from San Fran with all the views and accessibility you could ask for, while still being pretty hidden from the city rush! Sites 2 and 5 are accessible. They also have a Day Use Picnic Are. From this campsite, you have anything you could ever ask for. You have access to a coarse-sand beach with amazing views or the Golden Gate Bridge and the northern part of San Francisco, including historic Presidio. 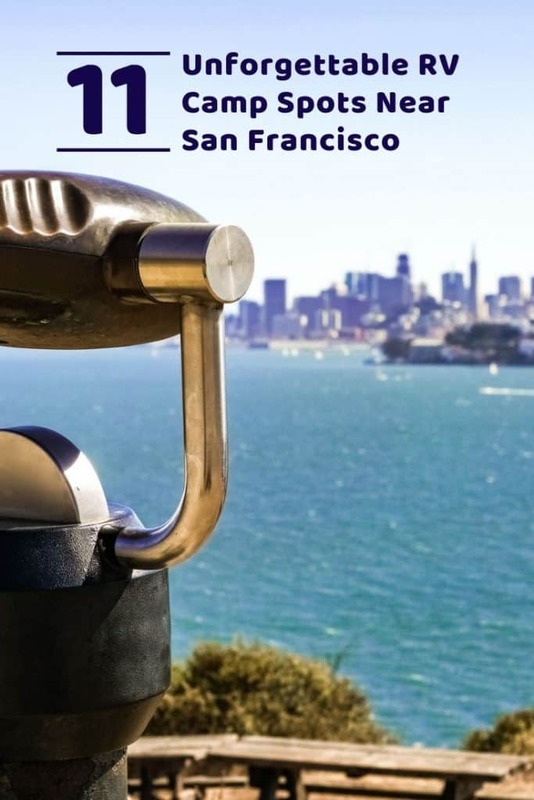 When staying at this campground, you have your own private safe-haven and complete access to go into town or other touristy places around San Francisco such as Fisherman’s Wharf, Alcatraz Island, Chinatown, and many shops, museums, restaurants, and other touristy activities. You will never have a moment where you are wondering what to do next. It is more likely you will be contemplating what you can cram into your schedule. The Big Basin Redwoods State Park is California’s oldest state park, established in 1902. This state park is located in the Santa Cruz Mountains surrounded by redwoods, spectacular views of the Pacific Ocean, waterfalls to adventure to, and so much more. There are many activities to do here including hiking, bicycling, and exploring to your heart’s content in the beautiful California Wilderness. Horses and dogs are both allowed here as well! It is a well-maintained place to camp and offers first-hand experience in the many wonders of the California wilderness and wildlife. 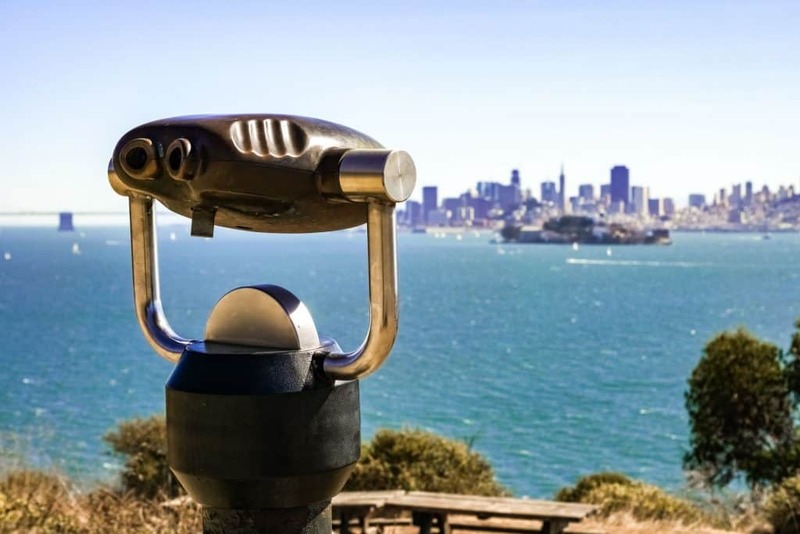 This park is about an hour and 45 minutes from San Francisco keeping you away from the crazy city life, but close enough to have memorable and exciting day trips to explore this exciting, lively city easily. China Camp Beach is definitely and experiences to be had. There are endless opportunities of fun to be had here for sure including a fun-filled beach experience, adventures, new experiences, and much much more. Explore nearly any hobby here! China Camp has fun activities such as hiking, biking, fishing, swimming, picnicking, windsurfing, kayaking, canoeing, stand-up paddle boarding, photography, and anything else you can think of. This campsite also has a grass park, museum, BBQs, boat launch, and a pier. Along with all of these fun activities, it is a very comfortable place to stay. They have restrooms, showers, an RV park and a campground, plenty of trails, and you can even bring your dogs with you! China Camp is a little under an hour away from San Francisco making it perfect because you are outside all of the city craziness and can have a luxury camping experience, while still being able to go to dinner and explore the town whenever you feel like it. Half Moon Bay is another super popular place to camp near the city of San Francisco. It is a very peaceful place to stay just outside the craziness of the city where you can relax and soak in the California sun. This camping area is popular for sunbathing, fishing, and picnicking in a very picturesque environment. It right next to Francis Beach, Venice Beach, and Coastside Trail that you can go explore. There are electrical hookups, dump stations and water filling station accessibility, and hot showers as well. Half Moon Bay is located about an hour south of San Francisco making it a perfect, quiet getaway at a beach location. With it being under an hour away from the city, it is super easy to spend your days exploring the city and then coming back to your serene escape in the evenings. Angel Island is an absolute must experience when visiting the Bay Area. Angel Island is the biggest island in the San Francisco Bay that provides the best outdoor experiences with the best views of the city from a private location. This beautiful island offers a memorable camping experience with gorgeous beaches, adventures, and amazing history and historical sites all across the island dating back to some of the earliest California inhabitants. The island is a mere 6 miles from San Francisco, and most of that distance is traveling over through the bay on a ferry. It is a private, yet easily accessible location to have memorable experiences in the middle of a city full of adventures. If you are looking for a great place to stay in your RV near San Francisco, Costanoa KOA is a great place to stay that you are sure to enjoy. It is located in a beautiful area about 45 minutes outside of San Francisco so you are definitely close enough to spend some good time in the city without having to stay in the city itself. 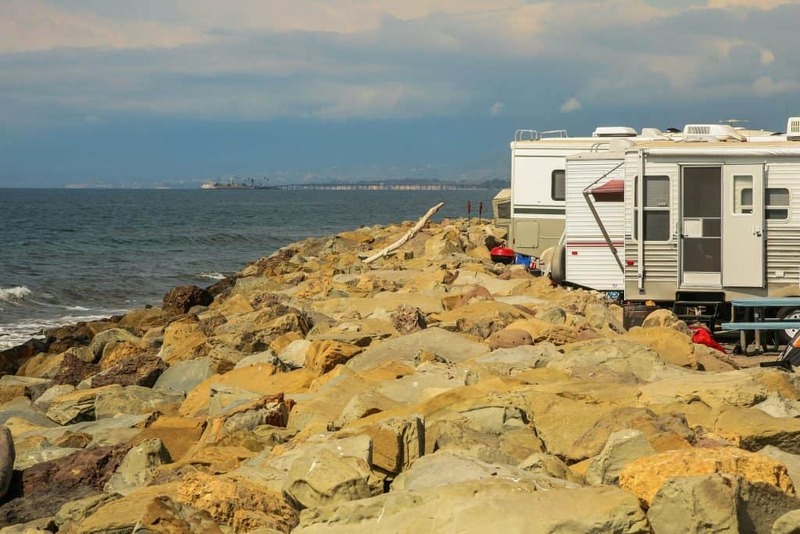 This RV resort is located right on the coastline of California with views that are sure to satisfy. You can smell the ocean from your RV! This RV resort offers a lot of amenities as well. These include WiFi, Propane, Cable TV, Firewood, and even a snack bar. Some of the activities that this campground offers include hiking, mountain biking, music, art exhibits, kayaking, horseback riding, and even spa treatments! This campground is sure to satisfy any type of camper through its wide array of activities to accommodate for both the rugged campers and the luxury campers. Mount Diablo is a perfectly placed state park in which there are 3 campgrounds that you can choose from. This state park has perfect views of the Bay Area and even Half Dome and Yosemite on clear days! These campgrounds have an array of amenities to accommodate for all your needs including an amphitheater, BBQ grills, a campfire center, campsite tables, drinking water, fire rings, a ranger station, and even showers for guests. This state park is sure to satisfy no matter which campground you choose to stay in! You won’t regret it or be bored for sure. San Francisco RV Resort is another campground that is hard to beat. This resort is set up on a 60-foot bluff overlooking the gorgeous Pacific Ocean, providing breath-taking views. This campground provides amenities such as a clubhouse, a store, laundry facilities, a playground, a WiFi hotspot, restrooms, shower facilities, and a picnic and BBQ area. Some of the fun things it has to offer are a hot tub, spa, and swimming pool, and a playground for the kids. This resort is also just 15 miles from San Francisco so you can go and explore the great big city all you want with no worry of traveling. This campground is especially great for those looking for a gorgeous place to stay that also want all the time in the world to explore the city and its many wonders. You won’t have to worry about accommodating for extra travel time to ensure you are back in time because it is just right there. Marin park is another great place to stay near San Francisco and the Bay Area. 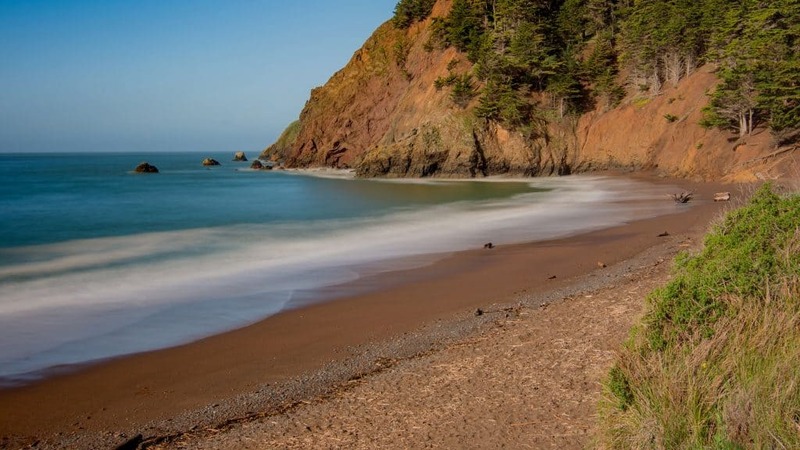 This gorgeous campground is just 10 miles north of the Golden Gate bridge and sure to serve you well. No worrying about getting up early and leaving your adventures early to ensure that you are back at your RV site at a decent time. You can stay out as late as you want because this location is right next to the city. This campground provides you with all of the amenities you will need for your stay in the Bay Area. These amenities include laundry facilities, a swimming pool, free cable TV, free WiFi, water and electrical hookups, restroom and shower facilities, an RV dump station, and even RV supplies. This resort also has a swimming pool and is pet-friendly. It is walking distance from a transit station to the city which will make your trip so much easier because you won’t have to travel far or even take your car into this crazy, exhilarating city. This campground is gorgeous and in the perfect location for those of you looking to have a close location to explore this gorgeous city. What are some popular tourist sites in San Francisco? What are some long-term RV parks in San Francisco?